In 1862 Captain John Mullan completed the military road from Walla Walla Washington to Fort Benton Montana. 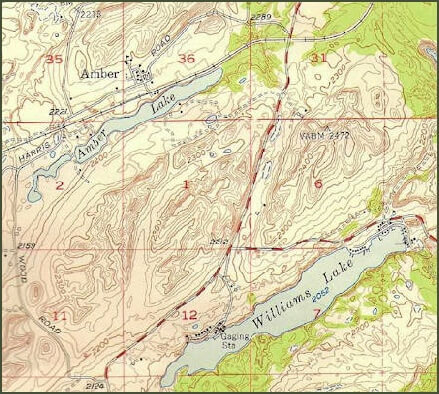 The Mullan road passed just south of the lake that would become Amber, 13 miles southwest of Cheney, 16 miles northeast of Sprague. One of the earliest settlers is thought to be Jack McElroy who was in the area in 1866. In 1869 Josiah “Si” Graves homesteaded land near the Mullan Road. He opened a blacksmith shop, and helped families traveling through. Johnny Williams, for whom Williams Lake is named is said to have arrived shortly after Mr. Graves. Other early pioneer families in the district were James Monroe Mason, T.V. Reed, Henry Jones, Rudolf Miller, Lorenz Franz, Olav Falk, John Mullinex, Adam Scroggie, and the five Calvert brothers; John, Joe, Dave, Eliaph and Sam. The area came to be known as Calvert or Calvert Crossing. The early farmers raised grain, hay, cattle and timber. Many settlers planted box elder trees to be paid by the government for the lumber. 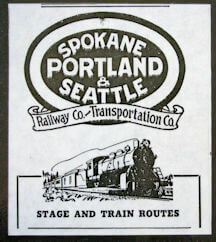 In March of 1908 the Spokane, Portland & Seattle (SP&S) Railway completed the Spokane to Portland leg which passed on the north side of the lake known as Calvert Lake. A depot which contained living quarters for the section foreman was built on the north side of the track. Regular train service was established by the following May. There were a number of unofficial and official post offices out in the countryside where mail was collected from and forwarded on to Sprague or Cheney. But on April 16, 1908 the post office of Calvert was established in the home of bachelor Bartley Costello. Calvert Crossing began to develop some businesses in support of the railway stop. The Amber consolidated school was built in the summer of 1910. By 1911 F.M. Mortiece had the Calvert Crossing Warehouse. Louis Houck of Cheney was a major promoter of developing a town at the site. He built a livery and feed stable. Alva Briner opened a blacksmith shop. A hotel was built by the lake. Soon a store and restaurant were added. Albert J. Falk had a store two blocks north of the railroad depot from 1917 until it burned in 1940. Bartley Costello found that mail delivery for Calvert was being confused with the town of Colbert north of Spokane. The story goes that he chose the name Amber after his favorite brand of tea. In 1912 James Monroe Mason and Ross Erlandsen bought the first automobile in Amber, a model T Ford, from F.L. ‘Bud’ Ratcliffe, of C.A. Ratcliffe Company in Cheney. 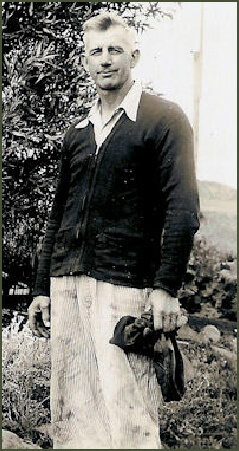 Bud Ratcliffe delivered the automobile and stayed with the men for a few days to teach them how to drive it. The Amber Grange was first organized in 1916. It disbanded during the first World War and was re-organized by Ira Shea in 1928. Wid Harper ran the hotel for a time and then Frank S. Bunker took it over for his resort on Amber Lake. Dances were often held at the hotel or in the Millman’s or Chamber’s barn. In the 1930’s religious camp meetings were held in the area and Mason Lake, just north of Amber, was used to baptize the converted. Also in the 1930’s the Arthur Studeman family lived at the depot where their father was the section foreman for the SP&S railroad. Daughter, Arlene, was born in the depot. The Amber school was one of the first consolidated schools in the southern district giving children the opportunity to attend high school. The first graduating class was in 1915. 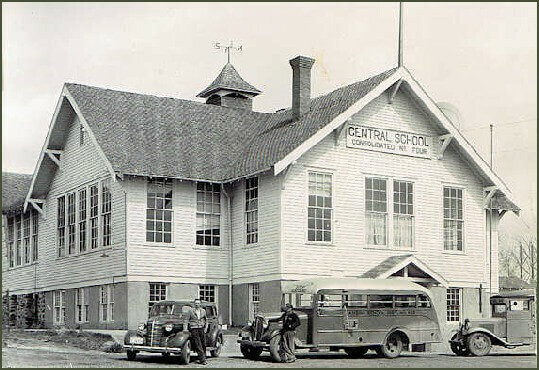 In 1966 the Amber district merged into the Cheney School District. The old school building continued to be used for a time by the community. At the end of 1974 the Amber Post Office closed having been operated by Martha Ellen Reed, later Mrs. Ivan Calvert, from her home since 1944. Finally, in November of 1979 the railroad ceased operation. The tracks and depot were later torn out and the line became part of the Columbia Plateau Trail. The trail head parking lot uses the space where the hotel and resort once were, and the trial signs face their readers to where the depot once stood. Amber has reverted back to a collection of houses and farms next to the beautiful lake.